A pompous developer plans to turn the new spirit portal into an amusement park, potentially severing an already tumultuous connection with the spirits. What's more, the triads have realigned and are in a brutal all-out brawl at the city's borders - where hundreds of evacuees have relocated! In order to get through it all, Korra and Asami vow to look out for each other - but first, they've got to get better at being a team and a couple! Better late than never? If you were were hoping for some on-screen confirmation of Korra and Asami’s newfound feelings for each other, this is what you need to pick up. While I and many others could have used this years ago, this was the nice continuation we were waiting for, and the not-totally-unexpected coming out of another character really added to the queer community in Republic City. 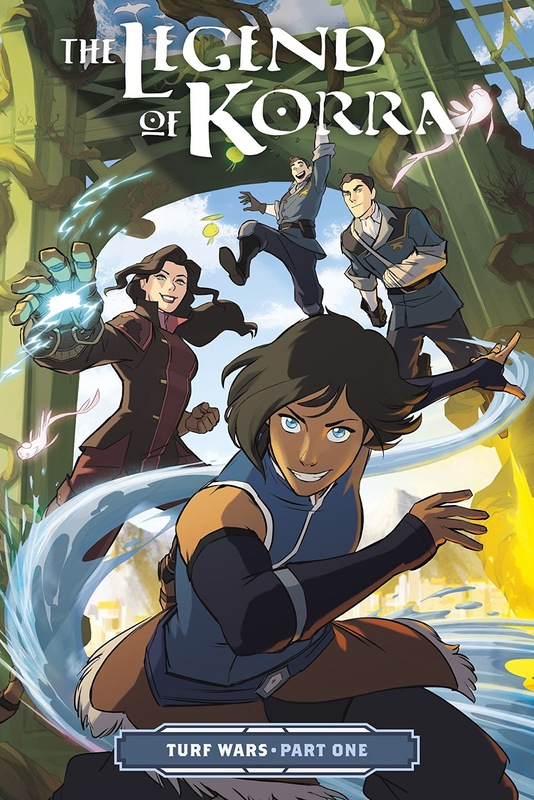 The story takes a backseat in this volume (at least that’s what I’m telling myself) while we reintroduce the scene and Korra and Asami navigate this couple and team thing. A new kind of trust needs to be established. I was a little underwhelmed by the villain in this. Starting off as a vicious and cool fighter, something different from what we’ve seen so far, but the whole introduction was a bit skimpy, there wasn’t any meat to the backstory. I hate when a bad guy has or develops a physical deformity. That said, I am very into the infrastructure plot that was established by the upheaval with the introduction of a new Spirit Portal and the destruction caused by Kuvira. We get more of that bureaucratic action here, as Zhuli steps up in a delightful subplot. More of that please! I’m really underselling the whole thing, aren’t I? Unforgettable highlights include: spirit world vacation, a kiss, a coming out, really cool fighting and Mako Bolin reactions. If you liked the show, you’ll want to check out this continuation.